The Got To Be NC Competition Dining Series has invaded the Triad once again. This year, the series is simply named after each host city in each region of the Carolinas. In 2015, Winston-Salem is playing host to the competition in the Triad at the Benton Convention Center in Twin City Quarter, the heart of Downtown Winston-Salem. 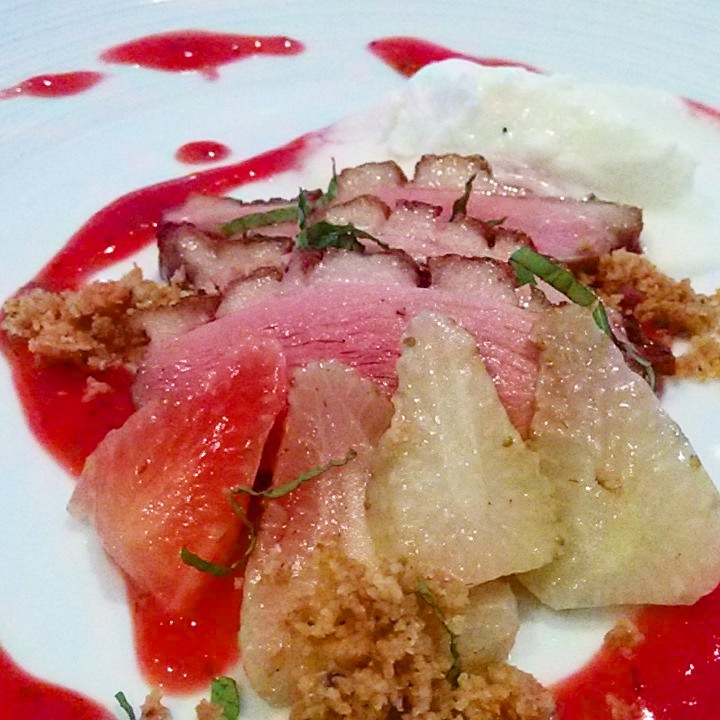 For those of you not indoctrinated in the ways of Competition Dining, check out other blog posts. I attended the June 2nd preliminary battle as a guest media judge between Christian Froelich of Hearth Restaurant at Sanders Ridge Winery in Boonville, NC and Anders Benton of Gia Restaurant in Greensboro. Chef Froelich is no stranger to the Dining Series as he formerly was the Executive Chef of Graze, formerly WS Prime in Winston-Salem and competed as a member of Team Springhouse Restaurant, Kitchen & Bar in 2014. Chef Benton is a newcomer to Winston-Salem as he's only been at the helm of Gia for a short period of time. At the tender age of 24, he proved himself a worthy opponent during the night's festivity. The secret ingredients, crackers and cheese: The Accidental Baker crackers and Goat Lady Dairy cheese. Soooo, this was a cracker with some stuff on it. 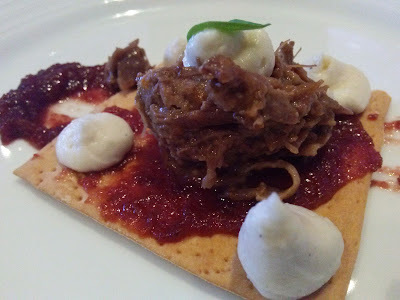 The cracker was not presented in a creative way, but everything on top of it was pretty good. The braised venison was severely underseasoned and did nothing to add to the flavor of the dish. If anything, it made the cracker less tasty. And the fluid gel? It seemed like an appropriate buzzword to put on a dish in front of progressive diners. Nothing more. My favorite course of the night, this was the most successfully creative dish. Who makes savory cheesecake? Chef Froelich does. In a post-battle conversation, he told me that he'd never made cheesecake like that before. He was on a chicken wing and a prayer and it turned out beautifully. 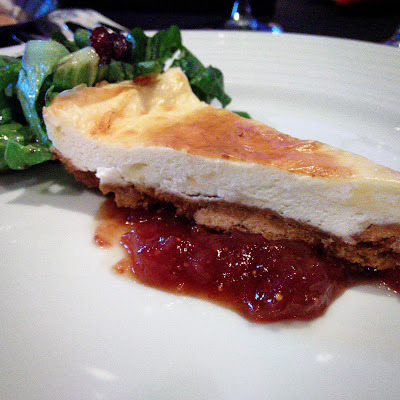 The crust of my cheesecake wedge could have been smoother, as the texture was a bit chunky, but the cheesecake itself was smooth, creamy and each bite was redolent of intense savory cheese flavor. Scoring high with creativity (I mean, who makes pasta dough out of crackers?! ), this course was great in theory, but was not well-executed. 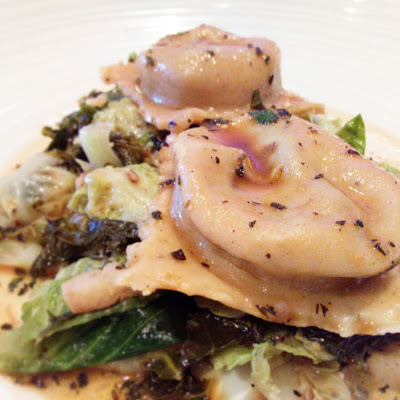 The pork cheek inside the ravioli was very well done and the best part. Opening up the pasta and digging out the soft, tiny pebbles of pork and Sandy Creek cheese was the best part of the dish, aside from the smoky Nueske's bacon dotting the mixture of braised kale and Brussels. The pasta dough was too thick and unpleasant to eat. This dish gets the most beautiful dish award goes to this course. The plate was painted with a single brush stroke of the pewter-hued onion ash. 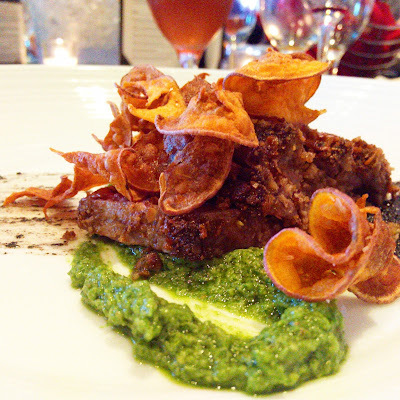 Atop that was a medallion of the ribeye covered with the sweet potato crisps, astride a swirl of sharp, green salsa verde. The taste? Well, the ribeye was perfectly cooked, but the "Rosemary Garlic Cracker Crust" was a fail. It was not crusty at all. It was soggy. The onion ash by itself was not to tasty (too vinegary with no depth of flavor) but with the salsa verde, it was perfection. It's too bad that the sweet potato crisps were on that fine line between burnt and flavorful. But the plate was pretty! Three letters describe this dish: WTF. It was like a nice dessert (the goat cheese sorbet was the BOMB!) with some slippery, soft duck slices on it that reminded me of tiny duck tongues. It was weird AF. I'm not even kidding. The winning part: the pickled green strawberries. They were sliced and I wished they were whole. And I kind of hated them a little bit. This course gets a slow clap for the attempt at being creative. My favorite part: the side-garnish of cracker garnished with the Sandy Creek cheese drizzled with the Cloister honey. 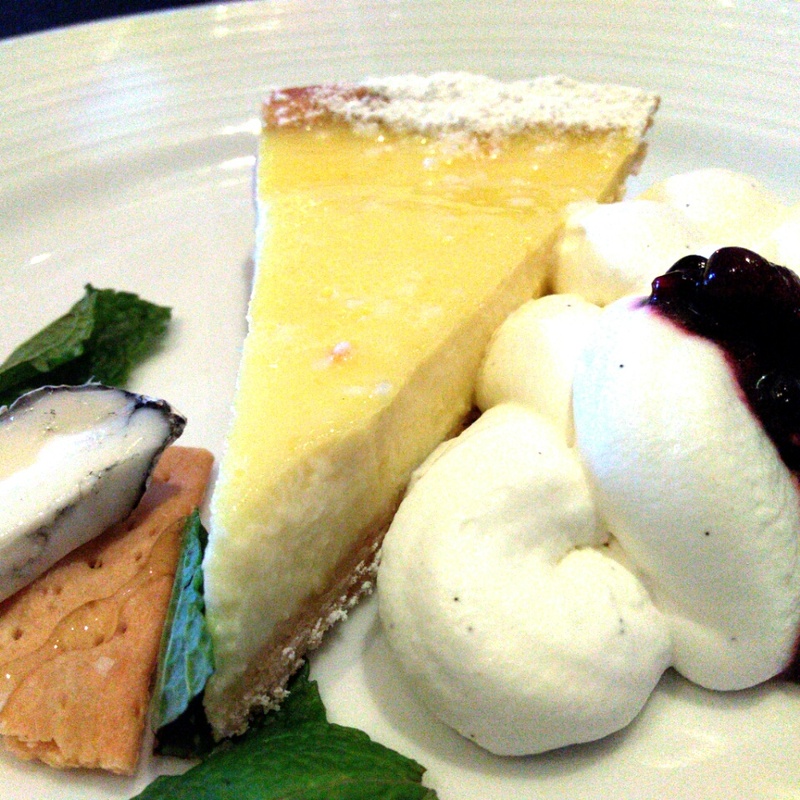 For some reason, I can't put my finger on it, it brought the tart to another level. The cracker crust on this was a little too buttery but the crumb was very fine. And the lemon custard was light and just the right amount of refreshing. Chef Froelich edged with 28.15 points to out Chef Benton's 23.56 points. Interested in eating, drinking and having a good time at Competition Dining? I'll be a guest media judge on Tuesday, June 30: Chef Dave Nicoletta of Giannos in High Point against Chef Richard Miller of Graze in Winston-Salem. It'll be a barnburner! I hope to see you there! Say hi! Tweet me! All photos are courtesy of Nik Snacks. All opinions and words are my own. I received no monetary compensation for my participation as a media guest judge, but my meal was complimentary.